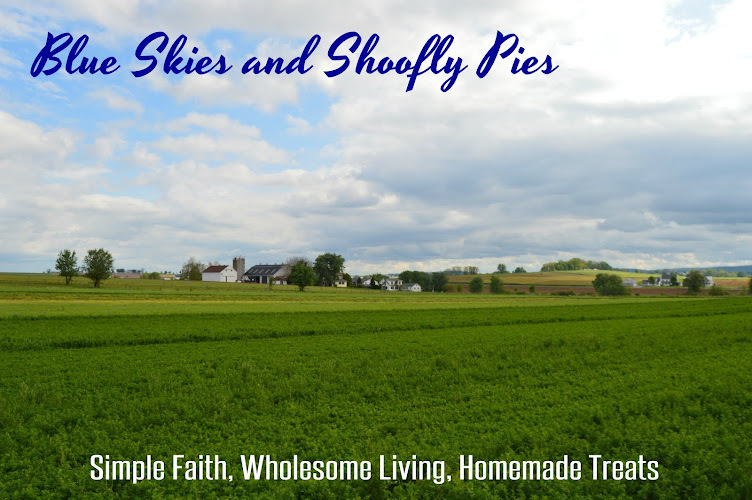 Blue Skies and Shoofly Pies: Banana Cream Pie from scratch, natch. Forget your boxes of instant banana pudding and pre-made graham crusts, here is a Banana Cream Pie with bunches of flavor for just a little more labor. This recipe is one of my personal favorites. The filling tastes like the best banana pudding you can imagine, while the topping is your choice of meringue or whipped cream. I favor the whipped cream topping. Real whipped cream is what I grew up with, and it is the perfect combination of airy richness to smother over the banana filling. Combine in a sauce pan. 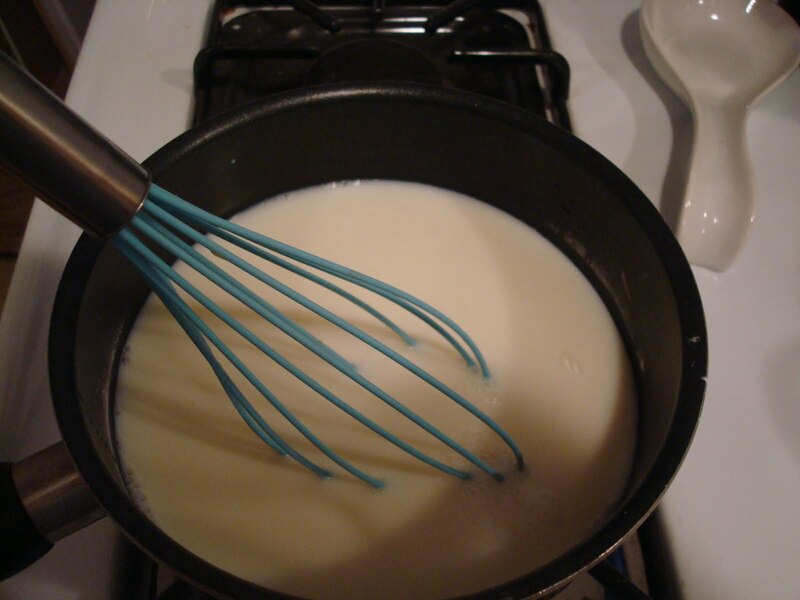 Slowly whisk in 3 cups of cold milk. Cook over medium heat, stirring constantly until it come to a boil. This takes a little while to happen, maybe 10-15 minutes, so just keep stirring. Once it gets to the boiling point you will notice the mixture is much thicker. Allow it to boil for one minute while continuing to stir. Remove from heat. In a small bowl, beat 3 egg yolks. Gradually whisk half of the hot milk mixture into the bowl with the egg yolks, while stirring. 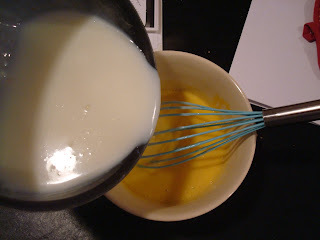 Next, return the egg yolks and hot milk mixture to the sauce pan, and continue to whisk until completely combined. Return the pan to heat and boil for one minute. Keep stirring! Finally, after a minute, remove from heat and stir in 1 T butter and 2 tsp. vanilla. Allow to cool for 10-15 minutes. The nice thing about making this in the winter is, you can set the saucepan on the porch and allow it to cool off quickly. This will speed things up if you need to do your topping right away. 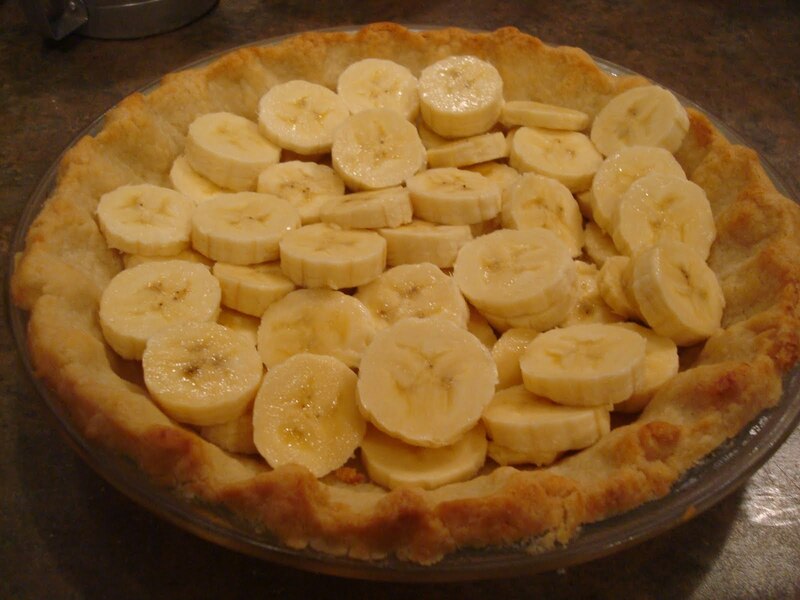 Fill your pie shell with 2 large bananas, sliced. When your custard is cool, pour over the bananas using a spatula to spread evenly. Now whip your cream: whip 1 cup whipping cream and 1/4 cup powdered sugar until stiff. Stir in 1/2 teaspoon of vanilla. 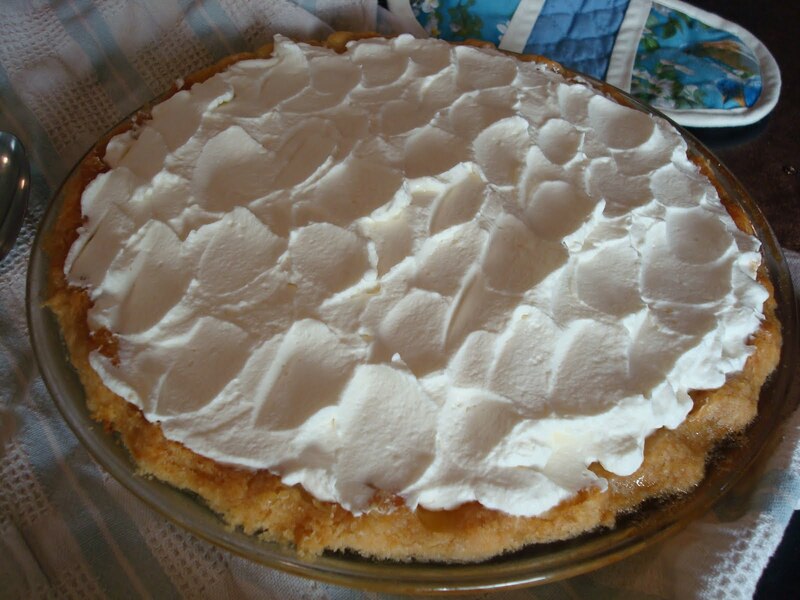 Spread on top of your pie, making sure that the filling is completely cold. 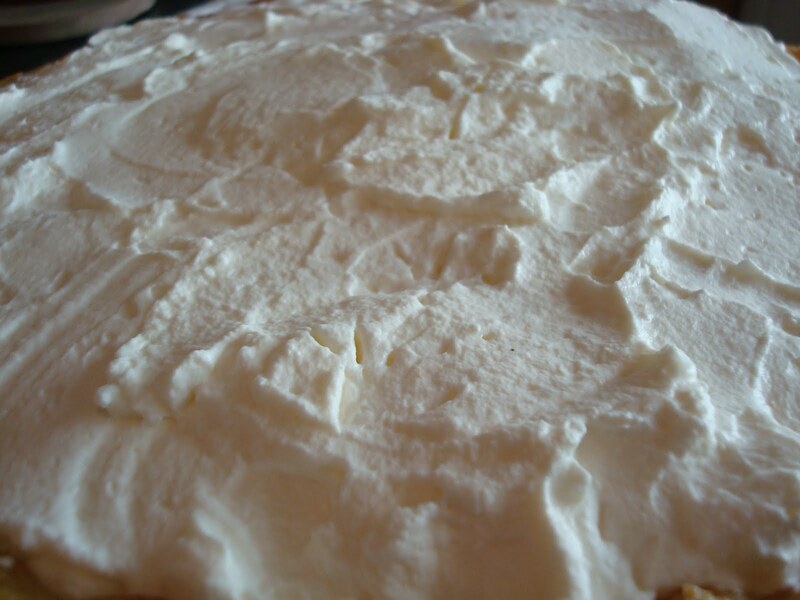 I like to refrigerate mine overnight and make the whipped topping the next day. Then, refrigerate until serving time. If it was completely up to me, and my coconut-intolerant Mister was nowhere to be seen, I would toast coconut flakes and sprinkle them over the topping. Some toasted sliced almonds would work well, too. Oh yummy yummy yummy! Banana Cream Pie is one of my all time favourites! I'm not a fan of banana cream, but I love a homemade vanilla cream pie. Yes, we need to get rid of the box mixes and make things the old-fashioned way. They do taste so much better. I can't make a crust very well. Mr. D needs whole wheat and I have an oil crust which does work, but if I try to cut in butter to make the crust it turns out leathery. Any ideas? Have you ever made a whole wheat crust? Oh Monica now that I'm trying to play catch up on your blog oh so many yummy things.. Now the best thing is your doing the pics and folks like me really need them it has me out.. thanks. Your friend in Maine. Yum! I want this right now - for breakfast!